The tumors can even reach the sylvian fissure. In rare cases, the tumors can develop extradurally or extracranially, developing as nasopharyngeal or pure posterior fossa craniopharyngiomas or as craniopharyngiomas extending down the cervical spine. A purely intraventricular craniopharyngioma is usually of the squamous-papillary (metaplastic) type and occurs very rarely. The vascular supply of the tumor originates from various sources, usually all of which come from the anterior circulation. Small perforators branching from the A1 segment of the anterior cerebral artery supply the anterior portion of the tumor; lateral portions receive perforators from the proximal portion of the posterior communicating artery; and branches of the intracavernous meningohypophyseal arteries supply the intrasellar part. Craniopharyngiomas are rarely supplied with blood coming from the posterior circulation, unless the anterior blood supply for the anterior hypothalamus and floor of the third ventricle is lacking. Recurrences usually occur at the primary site. 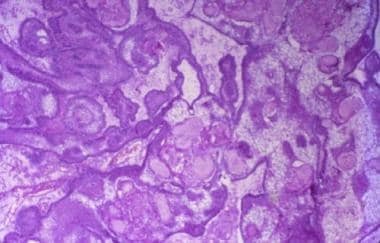 Ectopic and metastatic recurrences are extremely rare, but have been reported after surgical removal. The two possible mechanisms of seeding are dissemination of tumor cells along the surgical paths during the procedure and migration of tumor cells through the subarachnoid space or Virchow-Robin spaces, which explains ectopic recurrences distant from the surgical bed and within brain parenchyma. In one metastatic case, after removal of a suprasellar (adamantinomatous) craniopharyngioma, two peripheral lesions were identified seven years later, adjacent to the dura and contralateral to the initial craniotomy site. They proved to be composed of adamantinomatous tissue, raising the possibility of meningeal seeding. In another reported case, an adamantinomatous craniopharyngioma recurred at different intervals and at different sites, along the operative track of the initial surgical procedure as well as a distant site within the brain parenchyma, suggesting that both seeding mechanisms were involved in these recurrences. A craniopharyngioma is a slow-growing, extra-axial, epithelial-squamous, calcified, and cystic tumor arising from remnants of the craniopharyngeal duct and/or Rathke cleft and occupying the sellar/suprasellar region. Two main hypotheses—embryogenetic and metaplastic—explain the origin of craniopharyngiomas. These hypotheses complement each other and explain the craniopharyngioma spectrum. This theory relates to the development of the adenohypophysis and transformation of the remnant ectoblastic cells of the craniopharyngeal duct and the involuted Rathke pouch. The Rathke pouch and the infundibulum develop during the fourth week of gestation and together form the hypophysis. Both elongate and come in contact during the second month. The infundibulum is a downward invagination of the diencephalon; the Rathke pouch is an upward invagination of the primitive oral cavity (i.e., stomodaeum). The craniopharyngeal duct is the neck of the pouch, connecting to the stomodaeum, which narrows, closes, and separates the pouch from the primitive oral cavity by the end of the second month. Thus, the pouch becomes a vesicle, which flattens and surrounds the anterior and lateral surfaces of the infundibulum. Walls of this vesicle form different structures of the hypophysis. Finally, this vesicle involutes into a mere cleft and may disappear completely. The Rathke cleft, together with remnants of the craniopharyngeal duct, can be the site of origin of craniopharyngiomas. This theory relates to the residual squamous epithelium (derived from the stomodaeum and normally part of the adenohypophysis), which may undergo metaplasia. This theory explains the craniopharyngioma spectrum, attributing the adamantinomatous type (most prevalent in childhood) to embryonic remnants, and the adult type (most commonly squamous papillary) to metaplastic foci derived from mature cells of the anterior hypophysis. Prevalence of the adult type increases with each decade of life and is almost never found in children. Other cystic lesions may originate from remnants of the stomodaeum and pharyngohypophyseal duct as well, such as Rathke cleft cysts, epithelial cysts, epidermoid cysts, and dermoid cysts. Adamantinomatous craniopharyngiomas have been consistently reported to show alterations in beta-catenin gene expression. [8, 9, 10] Expression of beta-catenin correlates with some of the hallmarks ("wet" keratin, calcifications, and palisading cells) of adamantinomatous craniopharyngiomas. This abnormality has not been reported in papillary craniopharyngiomas. Beta-catenin is a transcriptional activator of the Wnt signaling pathway and a component of the adherence junction. The Wnt signaling pathway has been proven to play a crucial role in embryogenesis and cancer. Wnt signaling is involved in the determination of cell fate, proliferation, adhesion, migration, polarity, and behavior during development. It also plays an intricate role in the temporal and spatial regulation of organogenesis. The Wnt complex is made up of three different pathways: canonical, noncanonical, and Wnt/Ca+2. The canonical pathway regulates cell fate determination and primary axis formation through gene transcription. The noncanonical pathway regulates cell movements through modification of the actin cytoskeleton. The Wnt/Ca+2 pathway is involved in regulation of both cell movement and fate determination. Immunohistochemistry for beta-catenin in adamantinomatous craniopharyngiomas showed an abnormal cytoplasmic and nuclear accumulation. The normal membranous staining was present in adamantinomatous and papillary craniopharyngiomas. Sequencing analysis revealed beta-catenin gene mutations in adamantinomatous craniopharyngiomas, while none were found in papillary craniopharyngiomas. All mutations were missense mutations involving the serine/threonine residues at glycogen synthase kinase-3beta (GSK-3beta) phosphorylation sites or an amino acid flanking the first serine residue. These mutations are believed to lead to beta-catenin accumulation as a result of impaired proteosome degradation, this degradation itself being due to ineffective phosphorylation by a mutated GSK-3beta. Furthermore, the Wnt/beta-catenin signaling pathway has been shown to prevent differentiation (of mouse embryonic stem cells) through convergence on the LIF/Jak-STAT (leukemia inhibitory factor/Janus kinase ̶ signal transducer and activator of transcription) pathway at the level of STAT3. Interferons are known modulators of Jak/STAT pathways, thus revealing the possible molecular basis for interferons as a therapeutic option in adamantinomatous craniopharyngiomas. ER and PR expression in one correlative study was linked to higher differentiation and a decreased incidence of tumor recurrence and was proposed as a tool for recurrence risk stratification. Expression of human minichromosome maintenance protein 6 (MCM6) and DNA topoisomerase 2 alpha (DNA Topo 2 alpha) were proposed as histologic markers associated with a higher risk of recurrence in adamantinomatous craniopharyngiomas. Incidence rates of craniopharyngioma for African Americans exceed those observed for Caucasian, AIAN, and API. Distribution by age is bimodal with one peak incidence in childhood (0-19 years) and another in adulthood between ages 45-84 years old with a higher peak for ages 65-74 years. Overall, craniopharyngiomas account for 0.8% of intracranial tumors and 13% of suprasellar tumors. In the United States, the estimated incidence rate per 100,000 per year for the pediatric population (0-19 years) is 0.2, while it is 0.19 for all ages and all together 0.17-0.2 in various publications. In children, craniopharyngioma represents 5-10% of all tumors and 56% of sellar and suprasellar tumors. No definite genetic relationship has been found, and very few familial cases have been reported. Higher frequencies of all intracranial tumors have been reported from Africa, the Far East, and Japan; they are 18%, 16%, and 10.5%, respectively. No gender differences in incidence rate have been reported in all age groups. Craniopharyngiomas have a bimodal age distribution pattern, with a peak between ages 5 and 14 years and in adults older than 65 years, although there are reports involving all age groups. According to the latest CBTRUS for data collected for 2009 to 2013,  survival rates were 89.5% at 2 years and 83.9% at 5 years. These results demonstrate a slight improvement when compared to data from prior decades as stated above. When comparing age groups, the 5 year survival for ages 0-14 years was 92.7%, for adolescent and young adults it was 88.1% and for adults after the age of 40 years old it was 77.7%. Patients with craniopharyngiomas have overall mortality rates higher than the general population.